The second episode is already upon us. That first episode began confusing but ended strong which leaves this one in an uncomfortable situation. However, the only thing known for sure is this episode should introduce the Green or Black rangers which is a very easy concept to do. Click "read more" and let's see what happens. Side note: Back to beginning episodes with the theme instead of having a segment before and after it. The episode begins with Koh searching for Tyramigo (which is the name he gave his Kishiryuu or Zord). 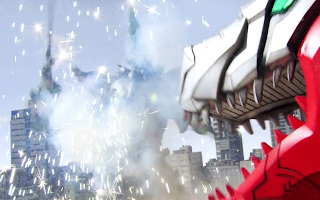 I guess Koh isn't familiar with Super Sentai lore; the big mechs always disappear after the battle. Melto says that none of the Kishiryuu are where they are at, so the 3 rangers go looking for them. As the rangers walked, Melto tells some exposition. Doesn't everyone just do that while walking with friends? It is a lot of re-stating backstory from the first episode, but they also give more details about the enemies. Bit early for flashbacks. The biggest point (literally) are the Minusaurs or the giant enemies bad dinosaurs. Also, Ui is still following them for her research. Koh forgot to wipe her memory. I'm sure that was translated from some other play on words. Wish I had an interpreter. 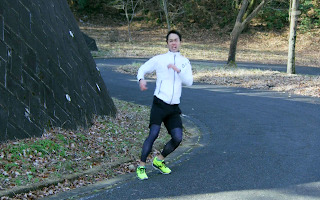 Elsewhere, we see a guy running and practicing some sword techniques. 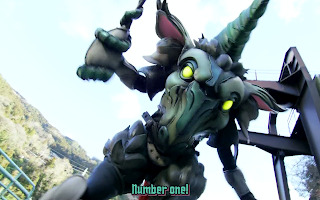 When, out of no where, Creon (our fungus fiend from the bad guys) appears above him and drops green slim in his mouth which causes the birth of a Minusaur. 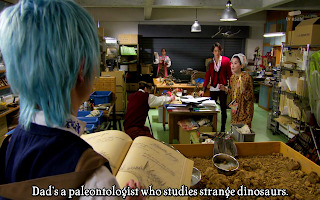 Meanwhile, the Ryusougers (Rangers) are back at Ui's house house with her Dad and are checking out all of their research. Why are they suddenly cooperating with her? Melto is especially fascinated with all their findings. Seems we got another brainiac blue. 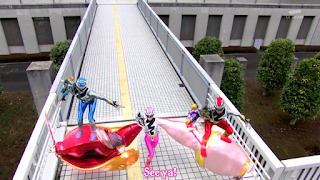 So, turns out the 3 rangers are going to be living with Ui and her Dad for awhile. When did residency become an issue? 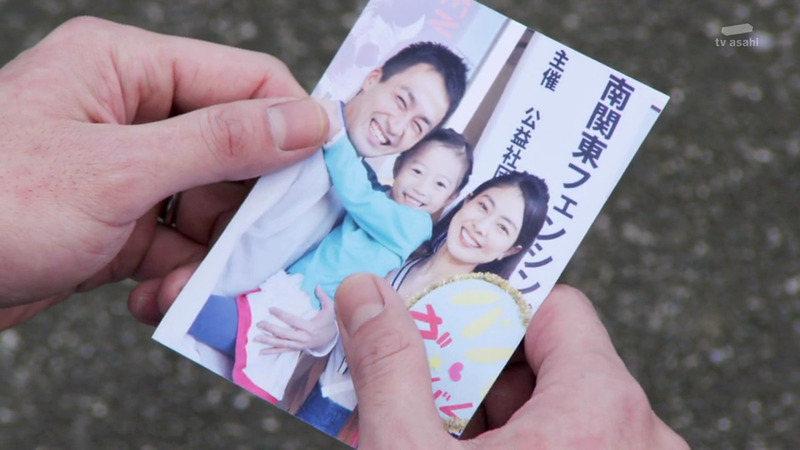 The fathers only request is that they become friends with Ui as she has not brought any friends home since elementary. Oh no, Ui is going to be the dorky sidekick character and the kid the rangers mooch off of. A combination of Nozomu and Emiri. Well, doesn't mean she can't have her moments. 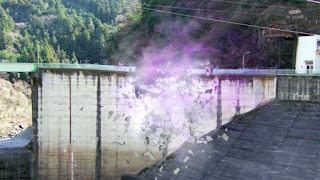 Ui's Fathers' research showed the existence of other temples besides the one the 3 current Ryusoulgers came from, so they go out looking for them. 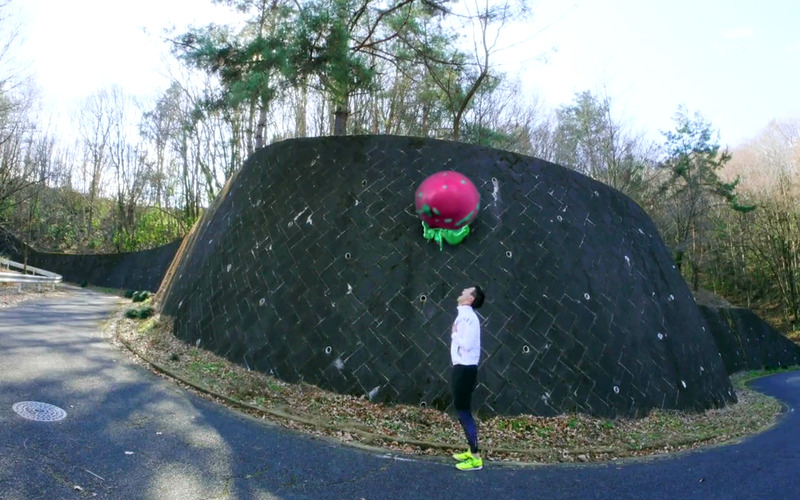 They soon find the jogger from earlier who it turns out is a fencer named Mishima. 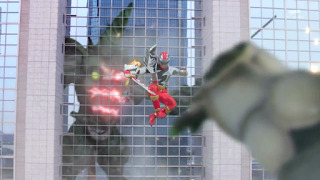 The rangers and Ui suspect Mishima may be a Ryusouger, so Ui goes to talk to him and he is given backstory. Mishima has a goal to become the number one fencer in Japan and swore he would not go home until achieving this goal. It has already been 2 years. So wait, he abandoned his wife and daughter for 2 years in order to chase a selfish dream of becoming the best fencer in Japan? Buddy, you will be lucky if you even still have a home to return too. This is the part when the action kicks in, a new Minusaur has a appeared. seems to be an incarnation of Mishima's minus emotions. Last year was Phantom Thieves and now we have monsters made from corrupted hearts. More Persona 5. Bonus! 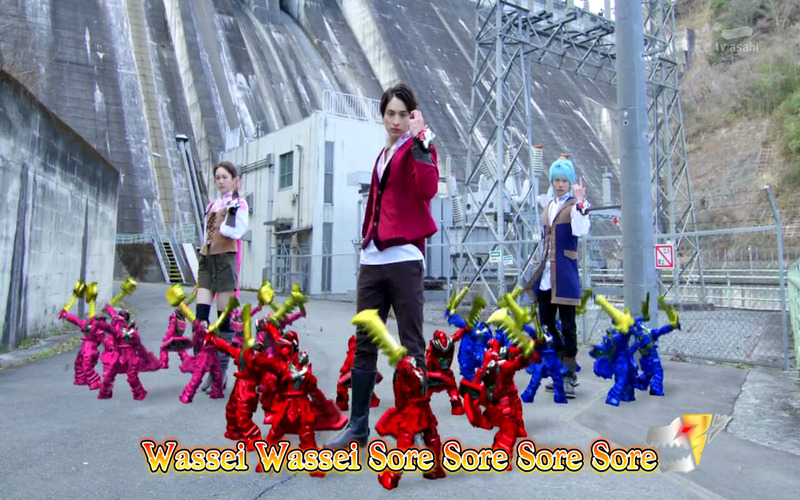 The Ryusougers henshin sequence is the silliest thing I've ever seen. 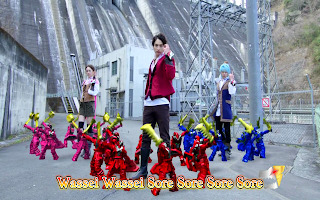 Even more than Akibaranger which was silly on purpose. 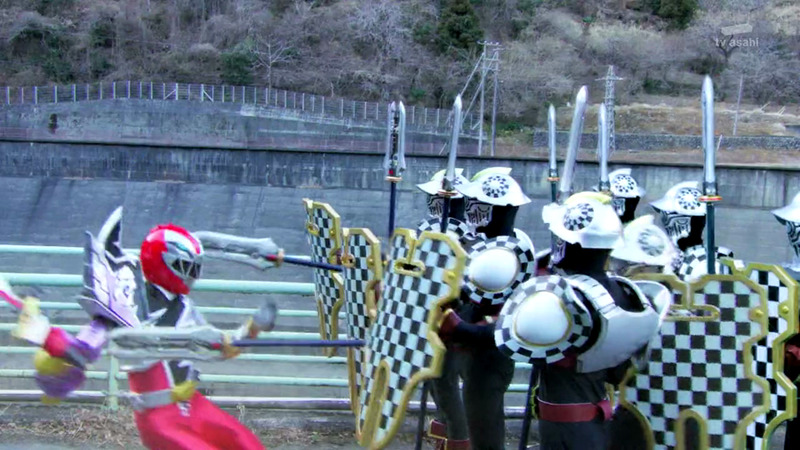 Silliness aside, the Ryusougers henshin up and begin battle. The fight mainly involves clashes of swords and the Minusaur has adopted Mishima's fencing and actually seems to be going in his favor. Koh decides to try another one of his abilities to try and turn things around, a stink bomb power. What? Unfortunately, while it does work, Koh ends up hitting everyone including himself and the other 2 Ryusougers. Smooth red, real smooth. Koh atempts to take advantage of the now knocked down Minusaur, but is knocked back by some Drunn Soldiers who were warped in to assist the Minusaur. Creon explains that he created the Minusaur and that they feed off the negative emotions from the humans they came from. Does that mean the Rangers will need to play therapist in order to stop the monsters? 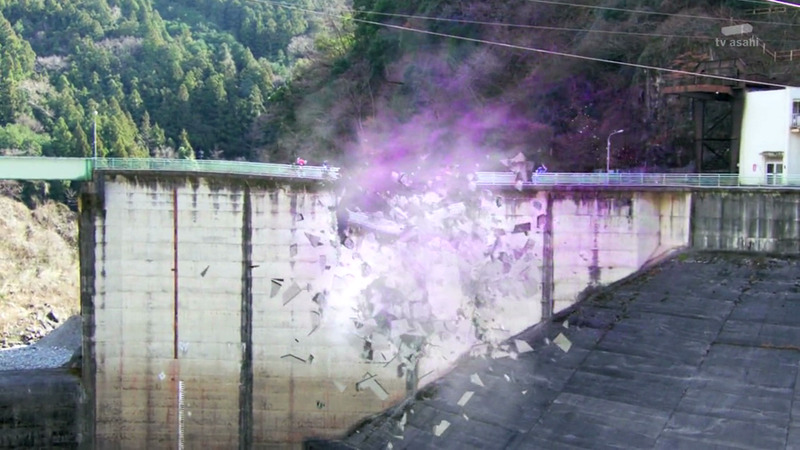 Well, the fight gets cut short when Tankjou appears and destroys a chunk of the bridge they were fighting on enabling all villains to retreat. The fact that villains actually fight back make this season a step above the previous season already. 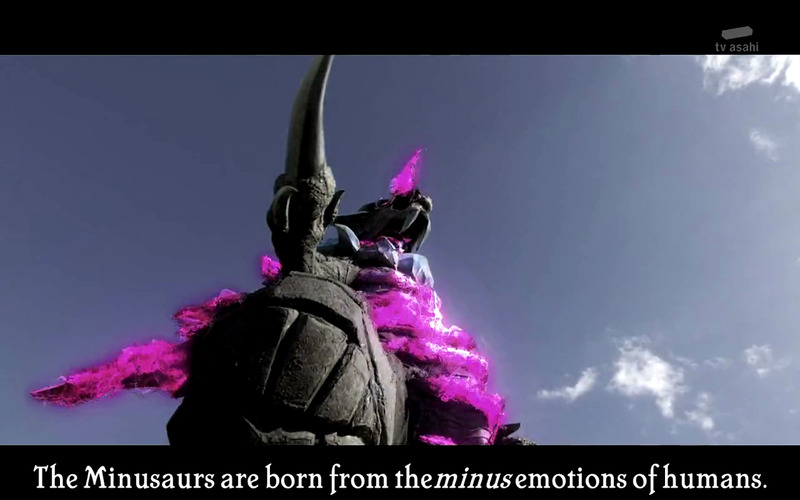 Given the info that Creon told them, the Ryusoulgers figure that the Druidons plan is to wipe out humanity now that they have the ability to create Minusaurs from humans. So, that's why they waited 65 million years to return. It also comes to the attention that whoever was used to create a Minusaur will have their life put in danger. Now at the hospital, Mishima getting weaker by the minute with his energy constantly being consumed. Koh and Ui go out to try and find Mishima's family. I predict they are hoping the family will change his heart and weaken the Minusaur. Koh and Ui manage to find Mishima's wife and daughter (in one scene) and they are both very supportive of Mishima, saying he is always number 1 to them even without fencing. That a very supportive wife for having been abandoned for 2 years. The Minusaur has now absorbed enough energy to reach giant form. That's a new way to make the monster grow. Melto and Asuna rush towards the giant still not knowing how to summon their Kishiryuu. They call Koh and tell him to hurry up and find the Kishiryuu when Mishima's daughter sees a picture of one and knows where it is. When convenience attacks. No no no! There is no way I can believe it was just laying around in public like that and nobody noticed or reported anything. 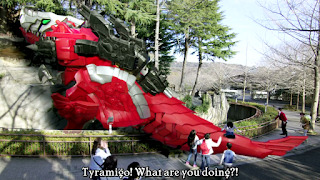 Stupid set up aside, Tyramigo has jumped into the action and is attacking the giant Minusaur without any pilot. 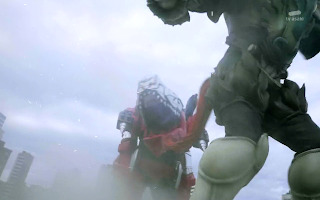 The giant battle has come good back and forth hits but not so good camera angles. Zoom out a little please. Things look good for Tyramigo, until the Minusaur throws dirt in his face which shifts the flow of the fight resulting in him losing. I wish I was joking, that is how the bad guy got a turn around win, dirt. Asuna and Melto are in shock, but Koh does not give up hope. Koh gives his speech about how limits can always be overcome can fires another stink bomb at the giant Minusaur. Sadly, the stick bomb doesn't work because the Minusaur is breathing through its mouth. That was almost a heroic moment. Also, pretty sure mouth breathing doesn't make you immune to nasty odors. There is some redemption; Asuna throws Melto and Koh into the air with inflated arms so Melto can lasso the Minusaurs mouth shut allowing Koh's next stink bomb blast to take effect. With the Minusaur now staggered from the smell, Koh delivers a big slash attack in mid-air. 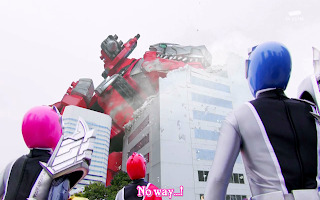 As dumb as the setup was, that was a pretty impressive move for a Red Ranger. Unfortunately, this was still not enough to defeat the Minusaur. Seriously, much better monster. Koh hears Tyramigo's voice and calls out "make our souls one." Bout time they addressed that title. Now, he goes aboard his mech and it gets a new form. 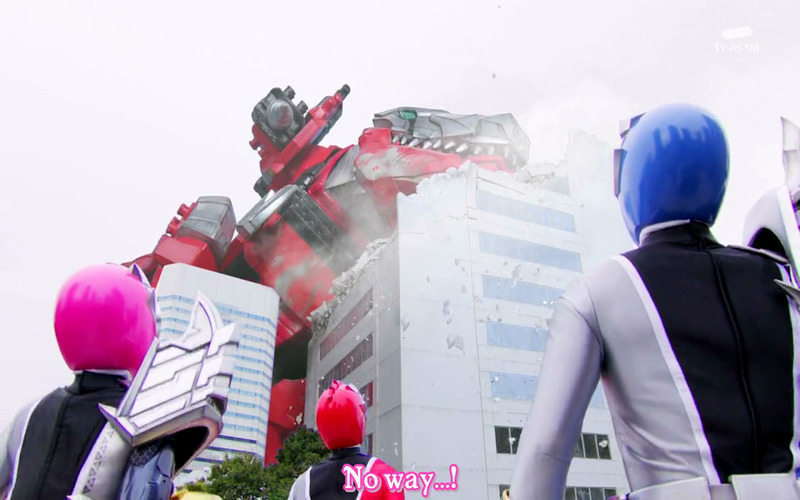 I think this is only the third time Red got a stand alone megazord. 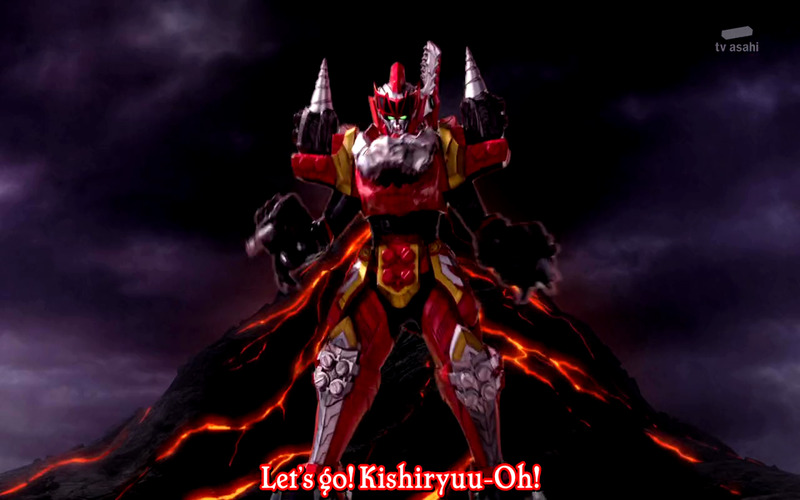 Back and stronger, this new red Kishiryuu-Oh is able to defeat the Minusaur. (But it still put up a fight.) Mishima wakes up in the hospital to his wife and daughter who held no grudge against him and the last thing we see is the Green and Black Ryusoulger training together before being approached my a mysterious man. The End! This episode went the exact same route as the first in terms of quality. The first half was kinda slow and uninteresting, but things got much better once the fighting started. 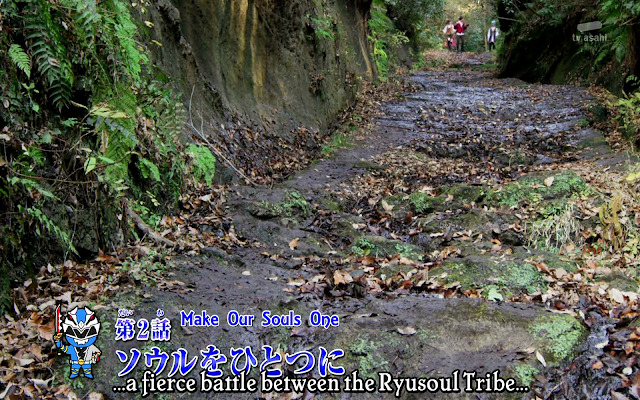 Normally, I am just as much into the character arcs as I am the fight scenes, but this season is really unfocused. 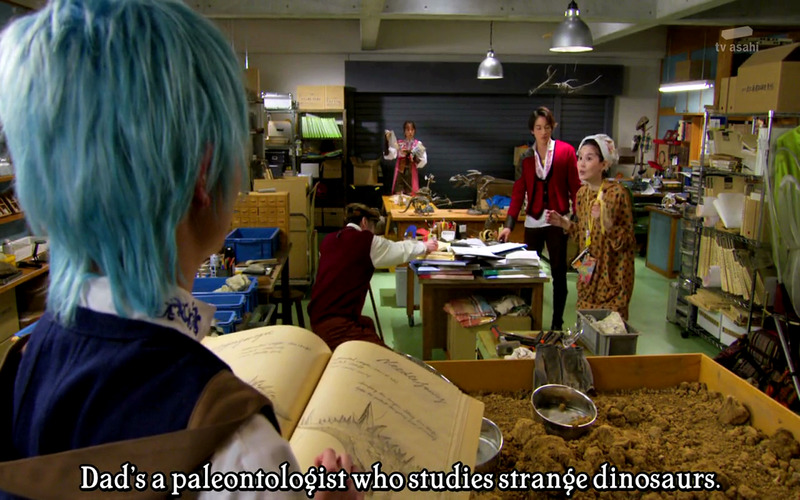 By the time the Minosaur showed up, everyone completely forgot they were looking for the other Ryusougers and that moment they showed up at the end felt like a reminder to the audience that they exist.